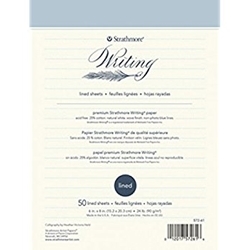 Strathmore Writing paper delivers the ultimate handwriting experience. Performs beautifully with a broad range of writing instruments including fountain pens. This package contains fifty 8.5" x 11" lined sheets. Acid free. 25% cotton.